“I am blessed with a multispecies family,” Sy Montgomery writes in How to Be a Good Creature, her memoir of life as an animal lover: “a family made not from genes, not from blood, but from love.” Following her surprise 2015 bestseller The Soul of an Octopus, a finalist for the National Book Award, she delves into her past, examining it through thirteen animals that became her dearest friends, taught her to overcome her fears, and helped her to develop zest for life. First came Molly, the Scottish terrier who was like a sister to Montgomery while she was growing up in Brooklyn. Scotties are stubborn and difficult to train; so was this headstrong little girl who, as a toddler on her first trip to the zoo, headed straight for the hippo enclosure. There have been other important dogs in her life since then, especially Tess the border collie. But none matched the charisma of Christopher Hogwood, the subject of Montgomery’s breakthrough book, The Good Good Pig (2007). 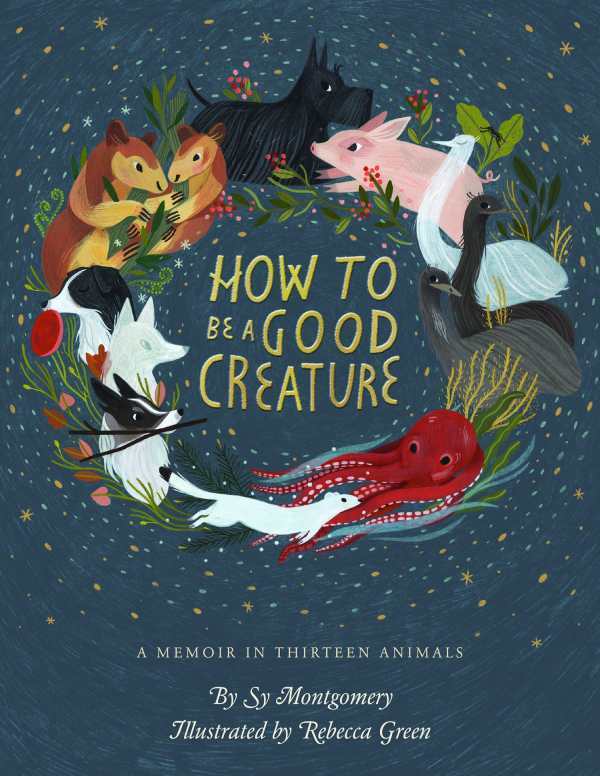 This is a slender volume, and certain of its chapters feel insubstantial, but with its pull quotes, photographs, and whimsical illustrations by Rebecca Green, it would make an attractive gift book for any animal lover.